Enabling exchange of data between disparate health information systems—or interoperability of health information systems—holds great promise for overcoming barriers to data quantity, quality, and accessibility. Many low-resource settings, however, do not have the guidance and tools to assess their capacity to implement interoperable systems. Some factors critical to successful implementation of interoperable information systems have not previously been well-defined. To address this gap, the MEASURE Evaluation project, funded by the United States Agency for International Development (USAID), in collaboration with the Digital Health and Interoperability Technical Working Group of the Health Data Collaborative, have developed an HIS Interoperability Maturity Toolkit. The kit contains three main pieces: a maturity model, an assessment tool, and a users’ guide. It also offers a complete list of the references consulted in a literature review that was conducted as part of the toolkit’s development. 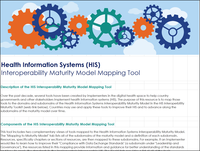 The HIS interoperability maturity model identifies the major components of HIS interoperability and lays out an organization’s growth pathway through these components. Countries can use the assessment tool to determine their HIS interoperability maturity level systematically. Using the assessment results, countries can create a path toward strengthening their HIS interoperability and building resilient systems. This is Version 1.0 of the toolkit. We published Version 0.5 in late 2017 and updated the toolkit in January 2019 with lessons learned from early adoption by Ghana and Uganda. 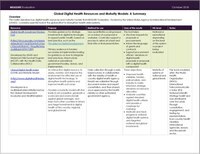 Access case studies on how this tool was used in Uganda and Ghana.